The MM700-1800B employs 16 printheads arranged in four staggered lines to achieve a best-in-class print speeds of 800 m2/h (*1) and 560 m2/h (*2) in draft and standard modes, respectively. Meandering sensor allows straight and accurate textile transportation even during high-speed printing. In addition, high degree accuracy control of the textile feeding, 2-pass, high-quality print without banding is possible. Banding is reduced through repeatedly gradation color of the edge of the pass. Beautiful and high image quality is possible in high-speed printing mode. 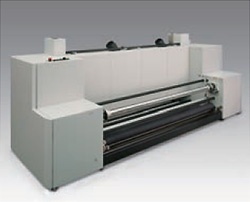 Direct-to-textile print requires high accuracy and a reliable textile transportation system. Wrinkles or drapes occasionally occur on textile when conventional textile transportation systems are used. The MM700-1800B is equipped with a drive roller bar that pastes and flattens the textile onto an adhesive transportation belt without wrinkling or draping by moving synchronously with the belt drive. The wrinkle sensor detects the wrinkles or drapes occurring in the textile and immediately stops printing to avoid printhead strikes. A highly sensitive sensor attached to the printhead detects even a slightly wrinkled or draped textile surface and prevents a printhead strike or a media jam, thereby reducing printhead damage. 20-liter large-capacity ink packs. The large ink packs ensure longer unattended operation and extended large-lot printing. 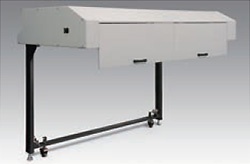 a standard for ink distribution tank and head internal heater. Maintaining the optional ink viscosity and a stable ink discharge amount in high-speed printing achieves head performance. 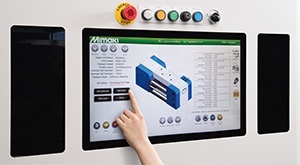 21.5-inch-wide touch panel display provides simple and easy-to-read printer operation status. Four ink types* are provided to suit a wide range of applications. The large-capacity 20-liter ink packs support high-speed printing. * One ink type can be selected at the time of purchase to be loaded to the printer; please note that the ink type cannot be changed once it is loaded. This unit applies the appropriate tension to the textile to ensure stable textile feeding while using an air brake and a dancer bar. 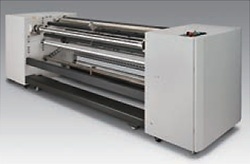 To prevent an ink set-off while taking up the textile, the additional heater shortens the ink drying time even at high speed printing with high ink density. A stable winding movement enables the taking up of the textile at high speeds without skewing. * Note that the heater may not completely dry the ink if a large amount of ink is applied. The camera monitors the distance of the textile feed advancement. The amount of textile feeding is optimized, which therefore improves the accuracy of the dot placement. High-performance software RIP "TxLink3 Professional" is bundled.